If this is anything, it's the (minimalist) home page of Tom Yates. What it isn't is anything to do with the US's astroturfed Tea Party movement. I want to make it clear that I have no sympathy whatsoever for their positions and views. My teaparty affiliations are all from the Mad Hatter's tea party, instead. This page is primarily intended to allow me to export certain pieces of information to the outside world. My current OpenPGP public key, signed by the most-recent-previous key. My most recent expired key, which may well be the one most recently used at a keysigning party. You may need this key to verify my current public key. Earlier keys can be had from me on direct application. Another of these pieces of information is our digital photo album, which is now organised with the excellent, free (primarily as in "free speech", but also as in "free beer") Gallery package. Older photos can still be seen here. In 2004 I started to log my technical explorations, and I have continued to do so whenever I'm breaking technical ground that's new to me. This is partly for my own benefit, and partly in case anyone else finds them useful. Absent any better name, I shall call them Tom's Tech Notes. Gerry: here's the webmail system, ok? 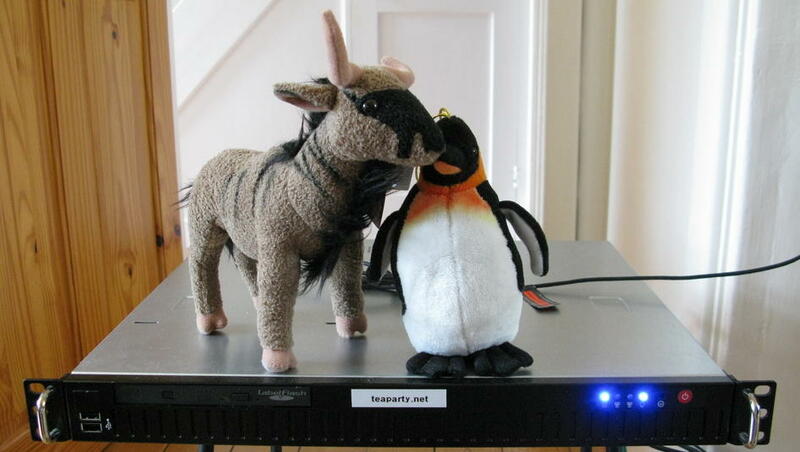 This website lives on its own co-located server, seen here in our lounge shortly before deployment, in the company of suitable friends. A picture of me working on an earlier incarnation of the server in an earlier colo can be found here. 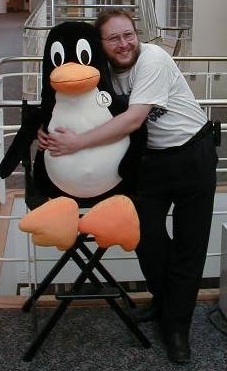 One of these is a cuddly master of free software and operating systems. The other is me. Email: madhatter-at-teaparty-dot-net (apologies for the address-scraper-blocking, but I'm getting about ten thousand spams a month and don't want to make life any easier for spammers). teaparty.net is my own domain. Email to it may sometimes bounce, if I'm between servers, but sooner or later it'll always be back on the 'net. Work-related email should be sent to tyates-at-gatekeeper-dot-ltd-dot-uk (again, apologies for the address-scraper blocking). If you're curious about the work of Gatekeeper Technology, specialists in open-source networking and security systems, drop me a line. We don't do Micro$oft systems; please don't waste our time by asking us to. I also write about free software professionally; most of this has been done for LWN (Linux Weekly News, as was). I live in Cambridge, UK. I used to have my address up here, but have removed it; email me if you need to know it. Alternatively, ask the Wayback Machine (to which I have deliberately provided no link). I do have a life. Herewith a partial list of my personal interests, which will acquire content in proportion to my spare time. Local politics: I'm a member and active supporter of the Liberal Democrats, the UK's third largest (but most progressive) party. Playing the trombone, most regularly with CSD Brass, the Kingfisher Sinfonietta, the Sinfonia of Cambridge, and the East Anglia Chamber Orchestra. Riding motorcycles, and motorcycle touring in particular. You can see our bikes here. Incidentally, if you live and ride in the UK, and aren't a member of MAG, the Motorcycle Action Group, you're taking a real chance with your own ability to ride the bike you like, in the manner you like, in the future. EU regulations, intransigent or downright hostile highways authorities, liability-related changes, poorly-maintained roads, all of these and many other threats continually face UK riders. Banding together through MAG is the best way I know to fight them. If you're in some other European country, find your local FEMA affiliate, and support them. "When the first 200 letters came, the guards gave me back my clothes. The next 200 letters came and the prison officers came to see me. When the next pile of letters arrived, the director got in touch with his superior. The letters kept coming, 3,000 of them, and the President called me to his office. He showed me an enormous box of letters he had received, and said: How is it that a trade union leader like you has so many friends all over the world?" Curries - cooking and eating. I seem to be spending quite a lot of time on ServerFault, an online sysadmin Q&A help site, where I go by the name of MadHatter. I got interested in the site because it allows authentication via OpenID, a protocol of which I much approve (but which is completely failing to be adopted because it breaks the big websites' ability to collect marketing data on their users). Edit 03/2018: they, too, are dropping it; sic transit gloria mundi. There is truth in the rumour that I wrote one, along with a friend from MIT; it's now out of print. We were working on a second edition, to cover 2.4.x kernels, iptables and OpenBSD 3.0, but Wiley decided they didn't want it after we wrote two-thirds of it. Perhaps we'll write another one later! Some reviews I've written of other people's books can be read here, though none is recent. I founded the toasters' administrators' mailing list, which as of 24/8/2011 has come back to teaparty; MathWorks, who kindly hosted the list for many years, have decided not to do so any more. Toasters are large file servers from Network Appliance, but if you needed to be told that, you probably won't find the archive very interesting. Don't let me stop you, though. You can see server statistics for most of these here. A number of mailing lists are hosted on teaparty.net, using GNU Mailman. The list of lists can be found here. Unless specified otherwise, any content that I created on this site is licenced under a Creative Commons Attribution-ShareAlike 4.0 International License.